If you’ve never been to a wedding, let us educate you on one rather outdated tradition – the bouquet throwing. The bride will stand alone and chuck her flowers (that she probably paid way over the odds for) as the guests and bridesmaids stand behind her attempting to catch it. Yes, this is the hilarious moment a man does a runner after seeing his girlfriend catch a bride’s wedding bouquet. 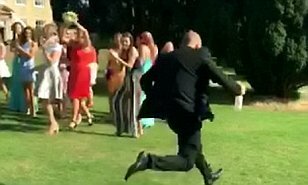 Video grab of the hilarious moment a man does a runner after seeing his girlfriend catch a bride’s wedding bouquet. See Masons story MNBOUQUET; The male guest was caught on camera running for his life after realising he might be next to get hitched. In the footage, he can be seen legging it moments after newly-weds Chelsea and Matt Best tied the knot in Kettering, Northants., on Saturday. In line with tradition, Chelsea flings the flowers into the crowd towards a group of women who all have their eyes on the prize. According to the MailOnline, social media users commented on the viral video saying their partners would react very much the same. She would then escape to the bridal chamber with her new hubby and we can all guess what happens then. Now, it’s all about passing on good fortune to whoever catches it – with a pretty similar ending (minus the getaway).